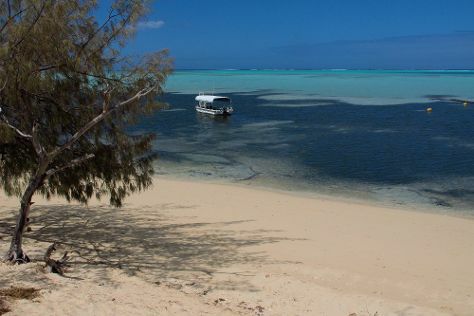 Bourail is a commune in the South Province of New Caledonia, an overseas territory of France in the Pacific Ocean.GeographyBourail a rural town of Grande Terre . Escape the urban bustle at Grand Terre: Poe Beach and Roche Percee and Sentier des Trois Baies. Museum-lovers will appreciate Fort Teremba and Musee de Bourail. Go for a jaunt from Bourail to Farino to see Parc des Grandes Fougeres about 52 minutes away. The adventure continues: get a new perspective on things with Bateau a Fond de Verre Poe, admire the landmark architecture of Eglise de Bourail, and get outside with Ranch de la Courrie. To see ratings, more things to do, photos, and tourist information, go to the Bourail trip site . If you are flying in from Australia, the closest major airport is La Tontouta International Airport. Expect a daytime high around 36°C in January, and nighttime lows around 24°C. Finish your sightseeing early on the 12th (Sat) so you can travel back home.